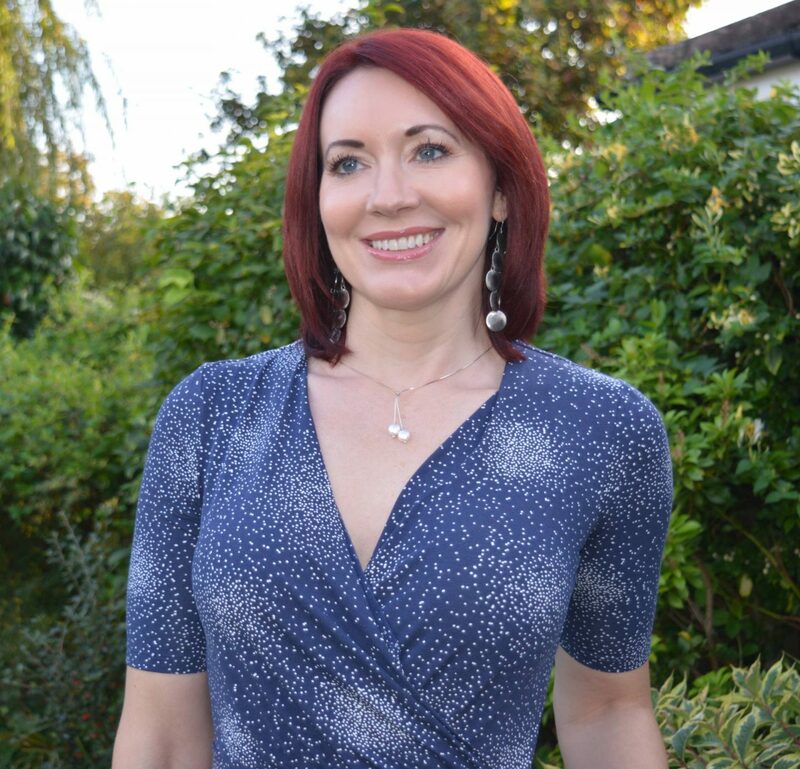 Because it’s a colour I wear a lot, I wanted to go all out by wearing red head to toe…well ok, head to ankle! Red is my favourite colour; it makes me feel confident and vibrant. Because it’s a colour I wear a lot, I wanted to go all out by wearing red head to toe…well ok, head to ankle! 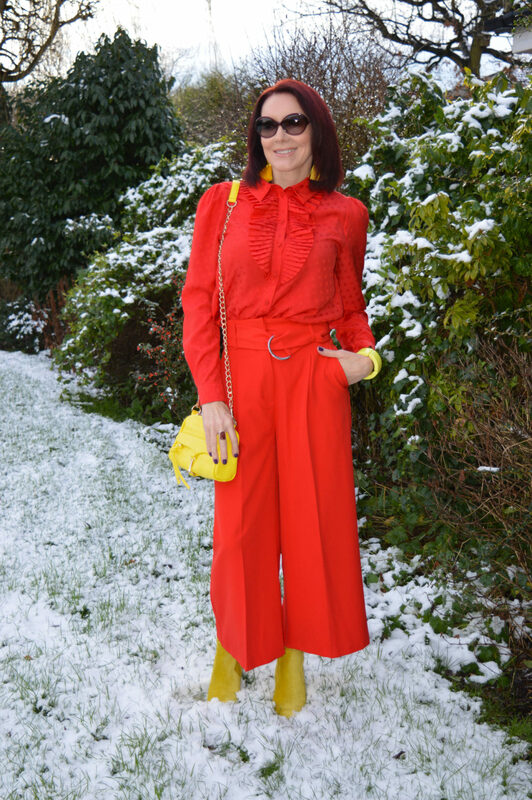 I have a couple of pairs of red trousers but these cropped ones are a near perfect shade match for my frill blouse (which I wore for the Style Not Age Frill Seekers post). The high waist style works well with the loose fit of the blouse, which needs to be worn tucked in or knotted at the front, otherwise it looks shapeless. 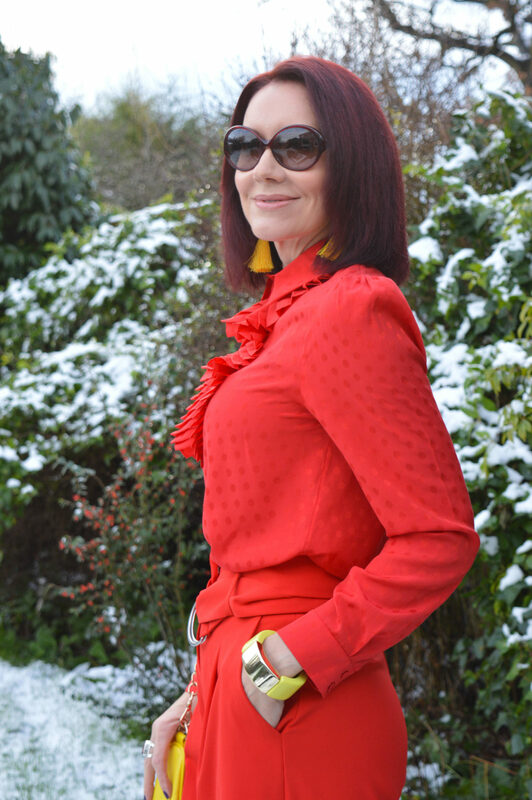 Often I’ll work three colours into my outfit, but I didn’t want to dilute the contrast of the yellow against the red. 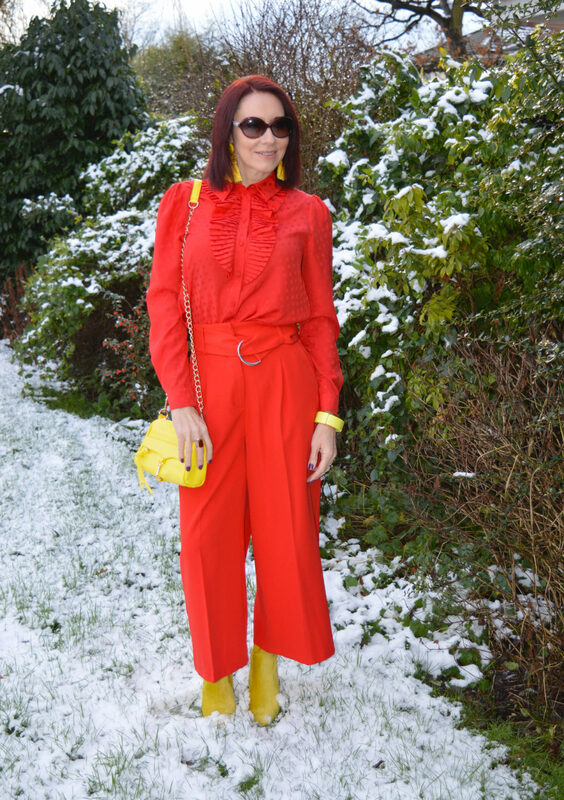 I didn’t plan on pairing yellow and red together – it’s not a colour combination I’d normally consider. But sometimes a flash of inspiration strikes and you hit upon a winner! Shoes were not really an option given the snow on the ground (it didn’t last long). These boots were still out of their box from the January Jumpers photo shoot, so I tried them and loved how they looked with the red trousers. 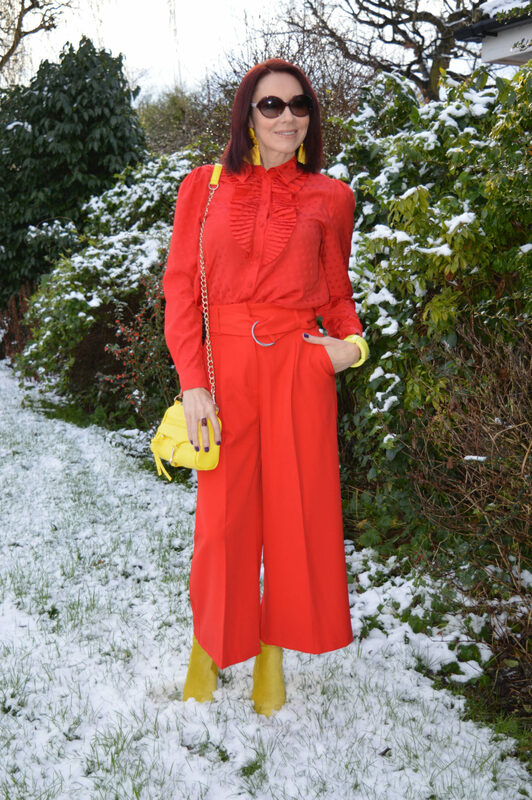 Often I’ll work three colours into my outfit, but I didn’t want to dilute the contrast of the yellow against the red. 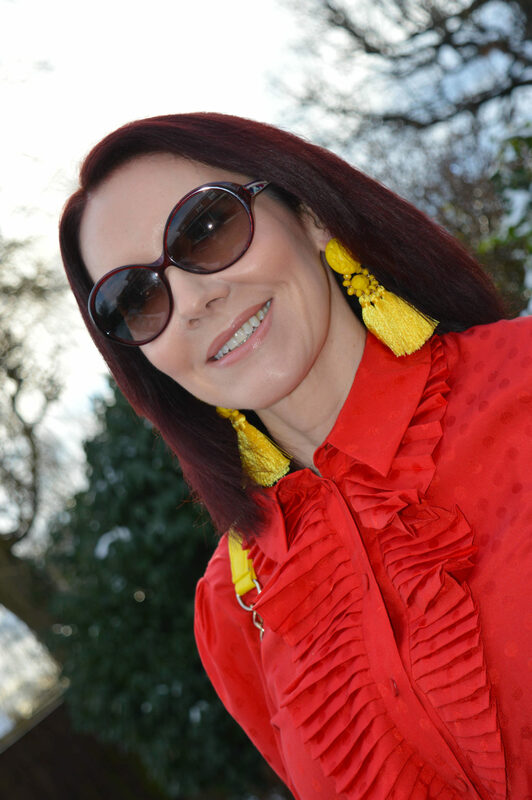 Adding a yellow bag, bracelet and tassel earrings keeps the colour palette simple but it packs a punch. I can’t think of another occasion where I’ve worn these two colours together, but I’ll definitely be trying this combination again! Do you love to wear red too? 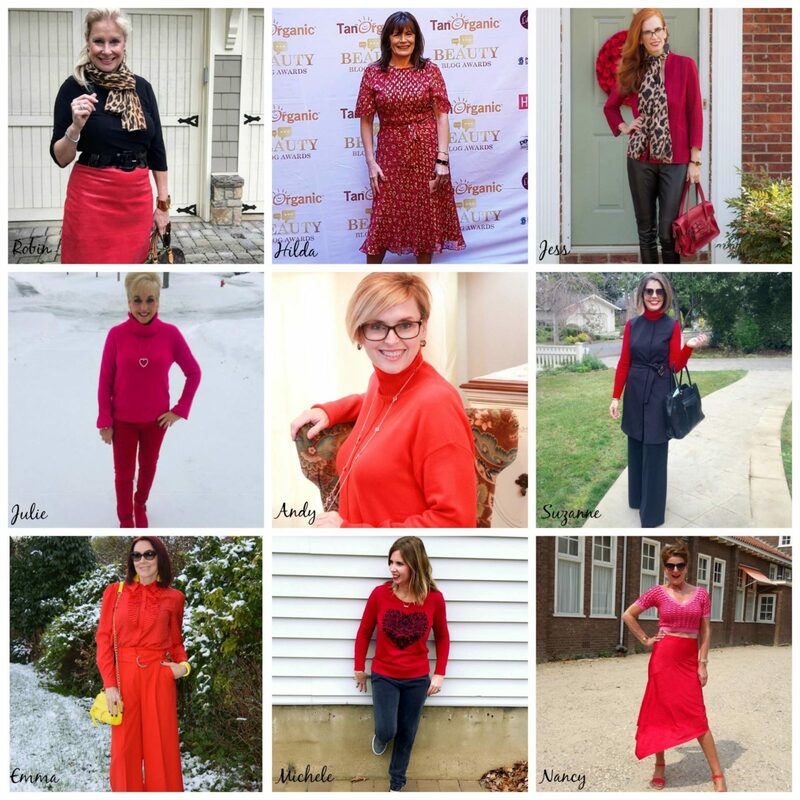 Head over to see what the other “Ladies in Red”are wearing…and don’t forget to join in the link up! (No Sunday Reflections link up this week because of this monthly one). I just love how you paired all red with yellow! What a gorgeous surprise combination. Such fun to collaborate with all of you this month, what beautiful looks! I love those culottes! They look fantastic on you and that blouse is so elegant. And what a surprising color for the accessories. Red certainly is your colour, Emma! And I love that you added yellow – you’re right, it does pack a punch! I’m totally in love with your blouse, it’s gorgeous! 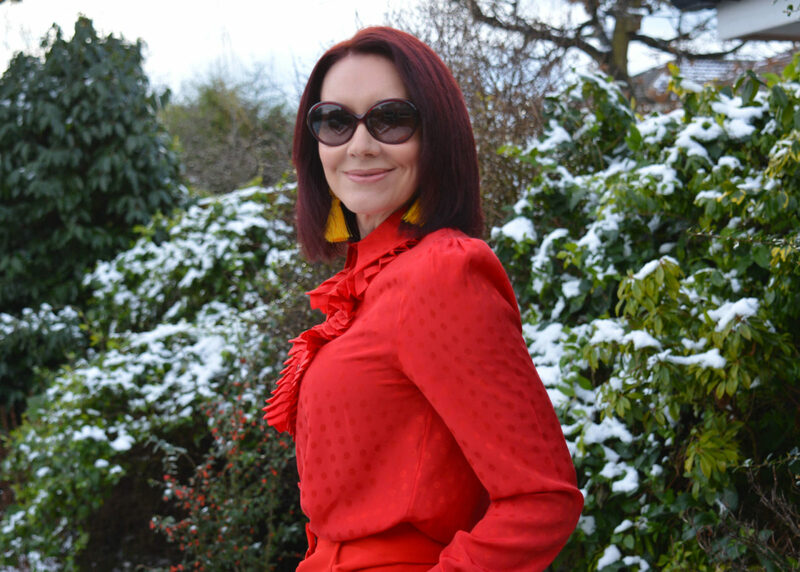 I just bought a fabulous new red jumper which I’m excited to show on the blog soon. So pretty! 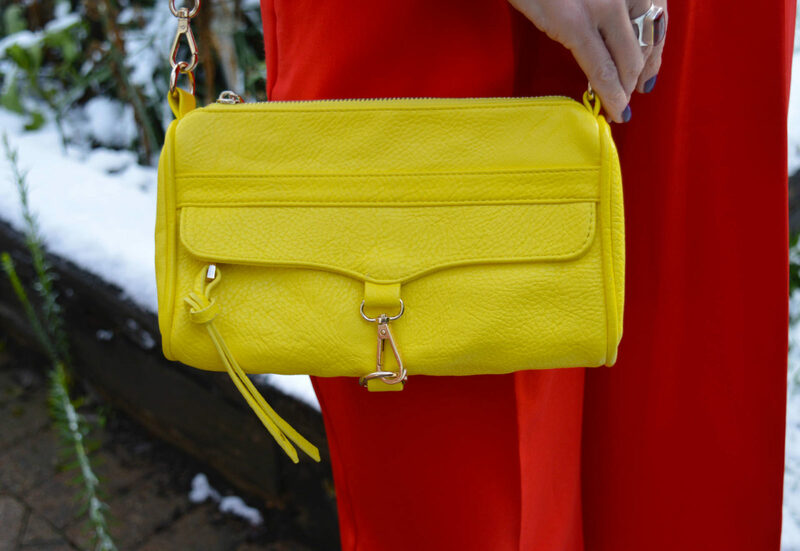 The pops of yellow are perfect. Emma, I absolutely adore these boots and every way I have seen you style them so far! I have a pair that is orange-ish (picante actually), but they appear red in photos…and now I want some yellow ones! So fun. And red is definitely a fabulous color on you! Emma, this outfit is gorgeous! That blouse is spectacular! At first glance I thought this was a jumpsuit as the red are so perfect together. 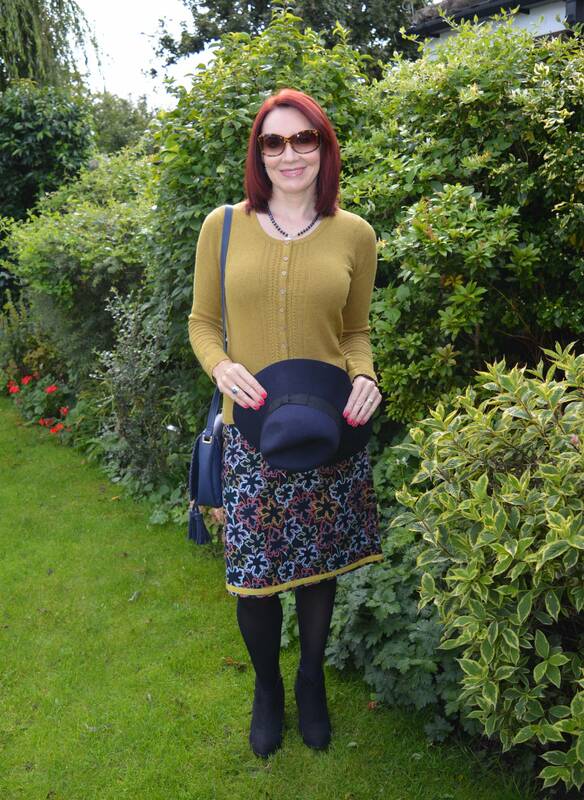 And I love the mustard yellow with it – so pretty and well done! Wonderful look on you Emma! I need more red in my closet, I love it! Especially on us with red hair! 🙂 The trousers look wonderful and I dont think to mix red and yellow I need to, as it looks wonderful! I love the yellow touches, great booties! I’m so glad that this collaboration brought us together! I love your sense of fashion and BOLD statement by pairing red and yellow together! You look AMAZING! The pop of yellow is something I would have never thought to do. 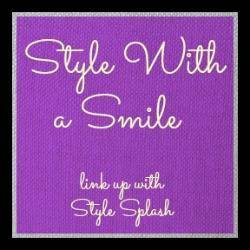 Thanks for linking up with Ageless Style!